Department of Quality Assurance 1, Abhilashi College of Pharmacy, Mandi - 175002, Himachal Pradesh, India. Department of Pharmaceutical Sciences 2, Lovely Professional University, Jalandhar - 144411, Punjab, India. 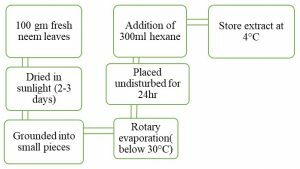 ABSTRACT: In this study, the synergistic effect of an extract of Azadirachta indica and Curcuma longa were investigated by the agar diffusion method. Different dilutions of the extract were prepared, and antifungal activity of the extracts of Azadirachta indica and Curcuma longa against Candida albicans was measured alone and in combination with fluconazole gel. The zone of inhibition of Azadirachta indica and Curcuma longa was found to be 9 mm to 14 mm and 8 mm to 13 mm respectively in the concentration range of 10-60 µL against Candida albicans. The fluconazole gel was prepared, and various evaluation parameters like; spreadability, pH, viscosity, and drug content were determined. Extracts of Azadirachta indica and Curcuma longa were taken in different strength (10-60 mg/ml) however the concentration of fluconazole gel was kept constant (1%) and zone of inhibition was determined. The maximum zone of inhibition was found with Azadirachta indica in the combination of 60mg/ml and Curcuma longa 20 mg/ml. INTRODUCTION: As per an examination performed by the WHO (World Health Organization), at the very least 80% population relies upon the traditional remedy for their key healthcare needs. The old therapeutic techniques, mostly the utilization of restorative herbs, still have a lively influence to protect the essential wellbeing wants in the developing nations 1-3. The therapeutic estimation of these plants relies upon the chemical constituent that creates a known practical activity on the metabolism of human body. Inside the ongoing years, regularly expanding helpful issues are the expanded level of diseases and antibiotic resistance. The utilization of plant and its products have been utilized for numerous long time, that started with conventional drug and throughout the years has been joined into allopathic prescription. Since, the distant past, numerous plants classes affirmed having pharmacological impacts as they are known to have different 2° metabolites like glycosides, saponins, flavonoids, steroids, tannins, alkaloids, terpenes which are, in this way, ought to be utilized to experience the organisms 4-7. Herbs used in conventional remedy contain an extensive variety of chemical constituents that can be used to treat and control continuing as well as infectious diseases. Natural products obtained from higher plants may have a new foundation of antimicrobial medication with the possibly innovative mode of action 8. They are useful in the treatment of infectious diseases while at the same time reducing many of the side effects that are often related to chemically produced antimicrobials. Therefore, it is of great attention to carry out a study of these herbs to quantify their use in popular medicine and to disclose the mechanism of action by segregation and description of their constituents 9. Material: Crude plant material was collected from the local area and authenticated by National Institute of Pharmaceutical Education and Research (Mohali), Fluconazole was purchased from Yarrow chemicals, Mumbai. Drug Profile: Triazole antifungal agent that is used to treat candidiasis infection and cryptococcal meningitis. Mechanism of Action: Fluconazole cooperates with 14-α demethylase, which is a cytochrome P-450 protein important to change over lanosterol to ergosterol. As ergosterol is a fundamental segment of the cell membrane candida albicans, restraint of its union outcomes in expanded cell penetrability causing leakage of the cell membrane. Fluconazole may likewise hinder endogenous respiration, cooperate with film phospholipids, restrain the change of yeasts to mycelial shapes, repress purine take-up, and weaken triglyceride and additionally phospholipid biosynthesis. Candida albicans: Candida albicans is dependent pathogenic yeast that is a common part of human microbial flora. It does not multiply outside human gut flora. Almost 40-60% of healthy adult’s population has candida albicans in their GIT and mouth. More than 20 species of candida can cause candidiasis in humans. Candida yeast mainly resides in the intestinal tract and can be found on the mucous membrane without causing any infection; mainly overgrowth is responsible for the infection 11. Candida can be found mainly in two physical forms, the yeast can survive in acidic conditions, although the fungal form flourishes in a neutral or alkaline ph. Therefore, it is difficult to treat with a single therapy Fig. 2 & 3. 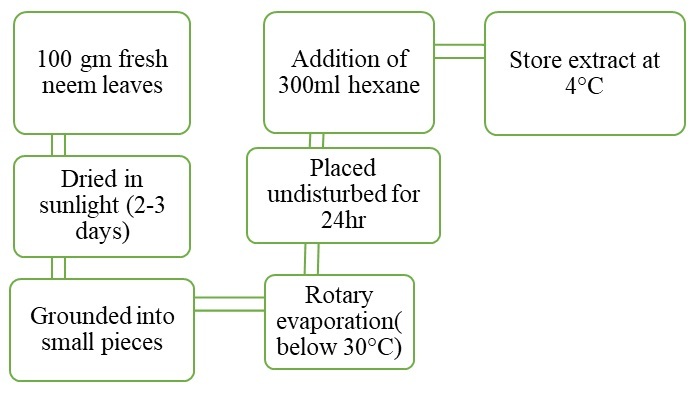 Fluconazole Gel Preparation: The composition of fluconazole topical gel was shown in Table 1. Fluconazole (1% w/w) was dissolved in a heated mixture of propylene glycol (20% w/w) and glycerine (10% w/w) used as the moistening agent. Cellulose polymer (HPMC, MC), polyacrylic acid polymer (Carbopol 940) gel was prepared by adding the calculated amount of in warm water. The previous mixture of the drug was added in the polymer mixture 12. Triethanolamine (TEA) was used as a pH regulator, for the proper mixing of ingredients agitation should be continuous. Finally, propylparaben and methylparaben were added with continuous slow shaking as a preservative. The prepared gel was placed in a round neck closed container in a dark room at room temperature Table 1. Neem Leaves Extract Preparation: Neem leaves extract has been prepared to dry 100 gm of dried plant leaves and ground into powder for the better mixing with hexane Fig. 4. After filtration by muslin cloth, the filtrate was evaporated using rotary evaporator below 30 °C and extract stored at 4 °C 13. Curcuma longa Extract: Fresh rhizomes of Curcuma longa were taken and grounded finely in mortar pestle with the addition of water and then exposed to steam distillation. The oily fraction was collected, and residue in water was filtered in a conical flask 14, 29. The water fraction was evaporated using vacuum condition overnight to give water extract. The residue was air dried and left overnight in chloroform (200 ml) and filtered, after that it is re-extracted twice with chloroform. 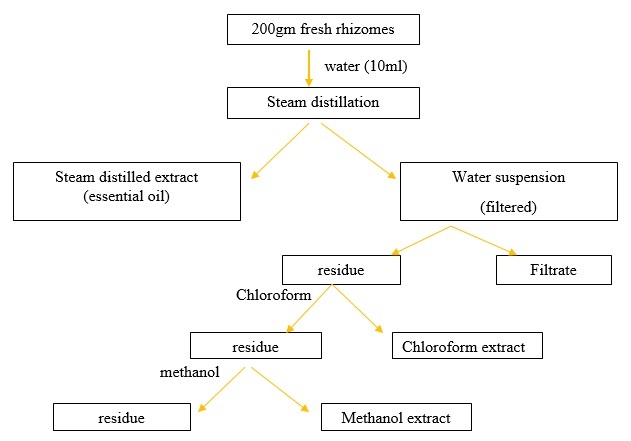 All the chloroform fractions were combined, and solvent was evaporated to get chloroform extracts Fig. 5. The residue obtained after chloroform extract was again extracted with methanol to give the methanol extract 15, 30. Visual Examination: Visual inspection of the prepared gel has been carried out for color and appearance. The observations reported that the color of gel formulations was white and was free from any gritty particles. Spreadability Test: Spreadability test of the prepared gel have been carried out with “parallel plate method.” The gel is being placed between two glass slides having a specific length. Weight has been placed on the upper glass slide for complete distribution of the gel in between glass slides. After some time, weight was removed. The plates have been fixed in such a way that the upper plates slide down from lower plate with the help of weight tied to it, the time is taken for the upper slide to slid from lower slide been noted down. The steps are followed three times and mean were taken. Where: S= Spreadability; M= mass placed on the upper slide; L= Length of the glass slides; T= Time taken for sliding by the upper slide. pH Determination: The pH of final formulation was determined by dipping pH- electrode of digital pH meter. Drug Content Uniformity Determination: Drug content determination has been carried out by taking 10 gm prepared gel in a conical flask containing 50 ml phosphate buffer having pH of 7.4, with continuous shaking for the complete mixing of the drug. The resultant mixer was then filtered through a 0.45 mm filtration membrane. The solution is then stored for 24 h absorbance of the different dilutions had been determined at the 266 nm wavelength. Rheological Studies: The viscosity of prepared formulation was determined at 25 °C using Brookfield viscometer. The spindle (no. 62) was rotated at specific rpm dial reading was noted down for further calculations. In-vitro Drug Release Study: Apparatus contains a glass cylinder (10 cm in height and 3.7 cm diameter) having both the sides open a cellophane membrane (previously soaked in distilled water) were tied at the end of the tube. 10 gm of gel was placed on the cellophane membrane in donor compartment, and the cell was immersed in a beaker (recipient compartment) having 100 ml phosphate buffer (pH 4.6) lower end of the test-tube should be placed like this it touches the surface of diffusion medium in recipient compartment. Diffusion medium was agitated using magnetic stirrer at 37 °C temperature. Sink conditions were maintained throughout the experiment. Samples were analyzed of different time intervals (0 min- 240 min) using UV visible spectrophotometer. Agar slants are-readied to inoculate microbial culture. To get ready agar slant, a required number of culture tubes are taken, and around 12 to 15 ml of liquified agar medium is poured in each of them. The tubes are presently cotton-plugged and disinfected in an autoclave. After the cleansing is over the tubes are taken out and are set in inclining (slanting) position for here and there; the tubes get cooled, and the medium in them is set bringing about a sloppy surface 16, 32. Both the tubes are opened by removing the cotton-plug with fingers of the correct hand, and the open mouth of the tubes is disinfected by going through the fire twice. The inoculum containing circle/needle is taken out and gotten inside the agar incline containing tube where the inoculum is simply rubbed on the surface of the agar incline. Every one of the means beginning from plug expulsion from the mouth of the tubes to the rubbing of the inoculum on the surface of the agar inclination ought to be taken rapidly to maintain a strategic distance from defilement. At the point when inoculation is finished, the open mouths of tubes and the cotton plugs are cleaned by fire, and the cotton plugs are supplanted. The growth of microorganism observed. Well Diffusion Assay: Subouraud dextrose agar media (SDA) is used for the determination of antifungal activity of plants extracts. Micro-organisms were spread over the media with the help of cotton plugs. Wells with a diameter of 8-10 mm have punched aseptically with the cork borer or a tip. Concentration ranges of plant extracts in 20 µl - 100 µl were placed in wells using a suitable solvent (DMSO). Then agar plates were incubated at 37 °C for 24-48 h Results were noted down in diameter inhibited growth of Candida albicans by extracts 17. Spreadability: Spreadability test of the prepared gel have been carried out with “parallel plate method.” The gel is being placed between two glass slides having a specific length. Weights have been placed on the upper glass slide for complete distribution of the gel in between glass slides. After some time, weight was removed. The plates have been fixed in such a way that the upper plates slide down from lower plate with the help of weight tied to it, the time is taken for the upper slide to slid from lower slide been noted down Table 1.
pH Determination of Various Prepared Formulations: The pH range of all formulation comes under the range of 5-7, which is acceptable for the avoiding of reduction risk of irritation during application. Results are tabulated in Table 2. Drug Content Determination of Various Prepared Formulations: The drug content is shown in the Table 4. After evaluation of the entire prepared formulations, drug content was determined and comes under the range of 80% - 86%. The uniform distribution of the drug was shown after the determination of drug content Table 3. 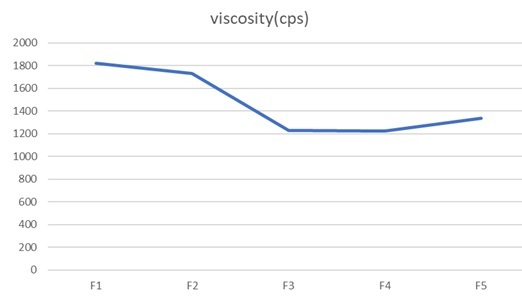 Viscosity Determination: The viscosity ranges of all formulations from 1230-1840 centipoises Table 4. 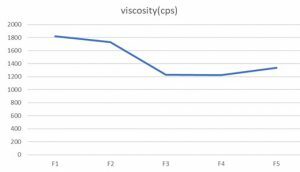 Viscosity is directly proportional to polymer concentration; more the concentration of the polymer represents the higher viscosity in the formulation Fig. 6. In-vitro Drug Release Study: The in-vitro release profile of all the prepared formulations was represented in Fig. 7. 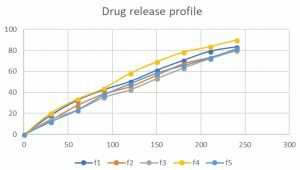 It was observed that the release of the drug from the formulation could be ranked in the following descending order: F4>F1>F5>F2>F3; the amount of drug release after 4 h was 90.64%, 83.49%, 80.86%, 80.24%, and 79.56% respectively Table 5. It was observed the factors which are affecting the drug release are polymer concentration and type of the polymer. Zone of Inhibition of Plant Extracts against Candida albicans: The effects of aqueous and methanolic extracts of concentration range between 10-60µL against Candida albicans were shown in Table 8 and 9 respectively. The maximum activity against Candida albicans was observed in the case of Azadirachta indica and Curcuma longa at the concentration of 60 mg/ml and 40 mg/ml respectively Table 7. Zone of Inhibition of Plant Extracts in Combination with Fluconazole Gel against Candida Albicans: After incorporating the plant extracts in the gel formulations, it was observed that fluconazole shows a synergistic effect in very low proportion. A synergistic effect was observed in case of Azadirachta indica, and Curcuma longa Table 8. CONCLUSION: Current study indicates that the plant herbal extract and antimicrobial agents combination approach provides significant therapy for the development of potential treatment for microbial infections. The antifungal activity observed for the plant extracts used in the study indicates the further development of effective alternate antimicrobial remedies. Crude extracts of Azadirachta indica and Curcuma longa have been used previously against various pathogens and proved to be effective. Also they both have shown the synergistic effect with fluconazole against Candida albicans. After performing all the physiochemical evaluations of the fluconazole gel, all the properties of gel were acceptable as an antifungal agent. The viscosity of the gel was optimum; pH value of all prepared formulations was under 5 to 7, which is acceptable for not causing any irritation and other side effects. All the plant extracts have shown antifungal activity along with synergistic action in combination with fluconazole. ACKNOWLEDGEMENT: The Author is highly grateful to the Dr. R. K. Abhilashi, Chairman Abhilashi Group of Institutions, Mandi, India for providing necessary facilities to carry out the research. 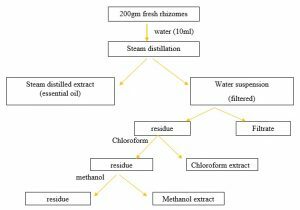 Liu ZH, Wang DM, Fan SF, Li DW and Luo ZW: Synergistic effects and related bioactive mechanism of Potentilla fruticosa leaves combined with Ginkgo biloba extracts studied with microbial test system (MTS). BMC Complement Altern Med 2016; 16(1): 495. Commission on Dietary Supplement Labels Issues Final Report. J Am Diet Assoc 1998. 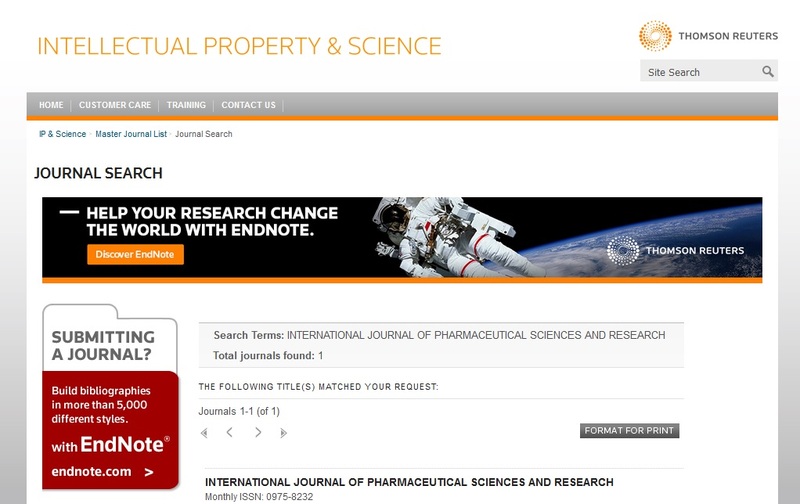 Borris RP: Natural products research: perspectives from a major pharmaceutical company. J Ethnopharmacol 1996; 51(1-3): 29-38. Hamburger M and Hostettmann K: Bioactivity in plants: the link between phytochemistry and medicine. Phytochemistry 1991; 30(12): 3864-74. Brantner A and Grein E: Antibacterial activity of plant extracts used externally in traditional medicine. J Ethnopharmacol 1994; 44(1): 35-40. Apisariyakul A, Vanittanakom N and Buddhasukh D: Antifungal activity of turmeric oil extracted from Curcuma longa (Zingiberaceae). J Ethnopharmacol 1995; 49(3): 163-9. Akpata ES and Akinrimisi EO: Antibacterial activity of extracts from some African chewing sticks. Oral Surgery, Oral Med Oral Pathol 1977; 44(5): 717-22. Annang F, Pérez-Moreno G, García-Hernández R, Cordon-Obras C, Martín J and Tormo JR: High-throughput screening platform for natural product-based drug discovery against 3 neglected tropical diseases. J Biomol Screen 2015; 20(1): 82-91. Maldonado PD, Chánez-Cárdenas ME and Pedraza-Chaverrí J: Aged garlic extract, garlic powder extract, S-allyl cysteine, diallyl sulfide and diallyl disulfide do not interfere with the antibiotic activity of gentamicin. Phyther Res 2005; 19(3): 252-4. Del Serrone P, Toniolo C and Nicoletti M: Neem (Azadirachta indica Juss) Oil: A Natural Preservative to Control Meat Spoilage. Foods 2015; 4(1): 3-14. Quelemes PV., Perfeito MLG, Guimarães MA, dos Santos RC, Lima DF and Nascimento C: Effect of neem (Azadirachta indica Juss) leaf extract on resistant Staphylococcus aureus biofilm formation and Schistosoma mansoni worms. 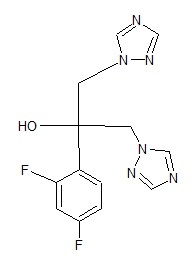 J Ethnopharmacol 2015; 175: 287-94. Mohamed NH, Liu M, Abdel-Mageed WM, Alwahibi LH, Dai H and Ismail MA: Cytotoxic cardenolides from the latex of Calotropis procera. Bioorg Med Chem Lett 2015; 25(20): 4615-20. Freitas CDT, Viana CA, Vasconcelos IM, Moreno FBB, Lima-Filho JV and Oliveira HD: First insights into the diversity and functional properties of chitinases of the latex of Calotropis procera. Plant Physiol Biochem 2016; 108: 361-71. Mutai C, Bii C, Vagias C, Abatis D and Roussis V: Antimicrobial activity of Acacia mellifera extracts and lupane triterpenes. J Ethnopharmacol 2009; 123(1): 143-8. Sakkas H and Papadopoulou C: Antimicrobial Activity of Basil, Oregano, and Thyme Essential Oils. J Microbiol Biotechnol 2017; 27(3): 429-38. Sopirala MM, Mangino JE, Gebreyes WA, Biller B, Bannerman T and Balada-Llasat JM: Synergy testing by E test, microdilution checkerboard, and time-kill methods for pan-drug-resistant Acinetobacter baumannii, Antimicrob Ag Chemother 2010; 54: 4678-4683. Saini A, Saini G, Singh B, Vyas M, Verma S and Prakash O: Synergistic effect of Azadirachta indica and Curcuma longa with fluconazole gel against Candida albicans. Int J Pharm Sci & Res 2019; 10(2): 692-00. doi: 10.13040/IJPSR.0975-8232.10(2).692-00. 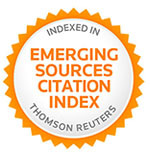 Authors Address: Department of Quality Assurance, Abhilashi College of Pharmacy, Mandi, Himachal Pradesh, India.